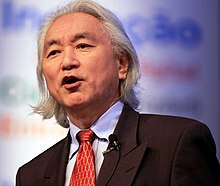 Michio Kaku (/ˈmiːtʃioʊ ˈkɑːkuː/; born January 24, 1947) is an American communicator and popularizer of science, futurist, theoretical physicist, and Henry Semat Professor of Theoretical Physics at the City College of New York. He has written several books about physics and related topics, has made frequent appearances on radio, television, and film, and writes extensive online blogs and articles. He has written three New York Times Best Sellers: Physics of the Impossible (2008), Physics of the Future (2011), and The Future of the Mind (2014). Kaku has hosted several TV specials for the BBC, the Discovery Channel, the History Channel, and the Science Channel. In the second video below in the 71st clip in this series are his words and my response is below them. Below is my letter to Dr. Kaku and evidence that I provided to him that answered his quest for remarkable proof. I noticed that you went to Christian schools when growing up and heard that on the program CLOSER TO TRUTH and that is what me started reading your material. Let me start off by saying that this is not the first time that I have written you. Earlier I shared several letters of correspondence I had with Carl Sagan, and Antony Flew. Both men were strong believers in evolution as you are today. Instead of talking to you about their views today I wanted to discuss the views of you and Charles Darwin. To get everlasting life in heaven, you have to trust that heaven actually exists. Speaking as a scientist, I think that there is a problem with regards to the afterlife and religious immortality, and that is there’s no proof that it exists. Remarkable claims require remarkable proof. But maybe you don’t need proof. Well, I do. Quotes like this indicate to me that you are a DOUBTING THOMAS type. YOU MAY FIND IT INTERESTING THAT CHARLES DARWIN WAS ALSO INTERESTED IN THE HISTORICAL ASPECT OF THE BIBLE. When I read the book Charles Darwin: his life told in an autobiographical chapter, and in a selected series of his published letters, I also read a commentary on it by Francis Schaeffer and I wanted to both quote some of Charles Darwin’s own words to you and then include the comments of Francis Schaeffer on those words. I have also enclosed a CD with two messages from Adrian Rogers and Bill Elliff concerning Darwinism.